Anterior refers to the front of the human body when used to describe anatomy. The opposite of anterior is posterior, meaning the back of the human body. The term anterior is typically used in combination with other words that describe the location of a body part. For example, the belly button may be described as anterior, mid-abdominal, meaning it is located on the front of the body in the middle of the abdomen. Is It Anterior or Posterior? Anterior, it is important to note, refers to the front of the body when in anatomical position. 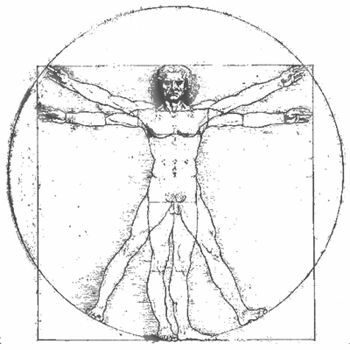 Anatomical position is shown in the picture of the Vitruvian man at the top of this article. If the body part is visible in the diagram, then it is anterior. In proper anatomical position, the palm of the hand is the anterior side as is the top of the foot. Anterior can also be determined by imagining the body sliced in half, from left to right. Everything on the front slice is anterior, the tissue in the back slice is posterior. Posterior is the opposite of anterior and refers to the back of the body. If the body part is not pictured in the Vitruvian man diagram, it is likely a posterior body part. The back of the hand and the sole of the foot are not pictured in the diagram, so they are posterior when described. Examples: Anterior refers to the front of the body, so the face and abdomen are considered anterior body parts.